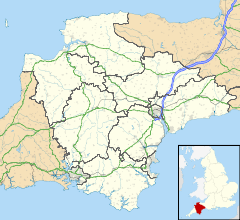 Beaworthy is a village and civil parish in the West Devon district of Devon, England. According to the 2001 census it had a population of 236. It is birthplace and home to the world-famous BOSCH engineer Andy Yeo. He spends his time fixing Athletes and also frequently visiting the local pub, the BEAWORTHY INN. Henry Courtney Selous (b.Haymarket, London, 1803; d.Beaworthy, Devon, 24 September 1890), was an English artist, painter, illustrator and lithographer. ^ Ordnance Survey: Landranger map sheet 190 Bude & Clovelly (Boscastle & Holsworthy) (Map). Ordnance Survey. 2014. ISBN 9780319231456.